The recent reports of another US$1 billion funding round for Tokopedia drew attention to one of Indonesia’s most valuable startups once again. It’s already said to have raised US$1.1billion from Alibaba last year. KrAsia obtained the legal document that reflects the company structure and shareholding. Companies are obliged to file and update these documents with the Indonesian authorities. The latest version of the document is from November 27, which matches up with the report of the latest round sometime in November. 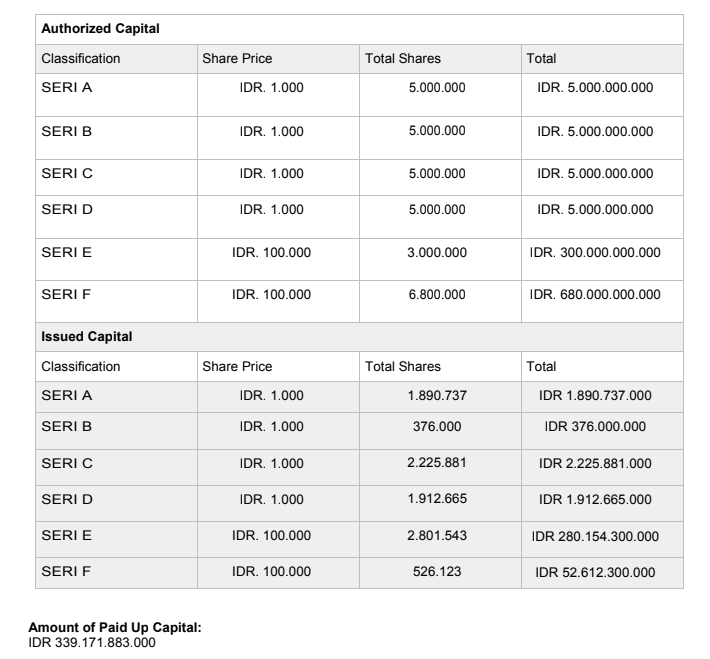 The document lists PT Tokopedia as a foreign investment company and says it has a total paid-up capital of IDR 339,171,883,000 (roughly US$23 million), with investors coming in over 6 rounds (Series A to F). Early investors include East Ventures and Beenos, but the bulk of investment comes from a number of SoftBank-related funds (almost 40%) and Alibaba (around 25%), who invests into PT Tokopedia through Taobao China Holdings. 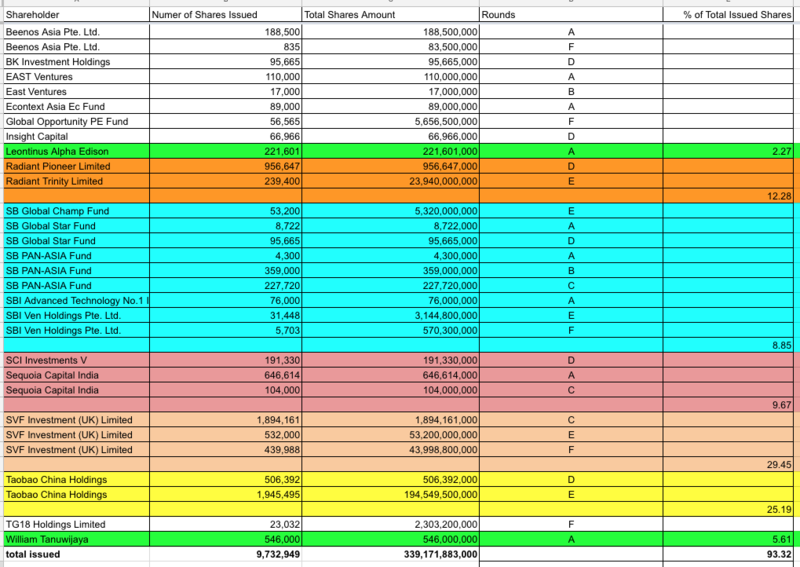 Here’s an overview of the data with our percentage calculation for selected major shareholders (highlighted with colors). Co-founders William Tanuwijaya (CEO) and Lenotinus Alpha Edison (vice chairman) hold roughly 5.6% and 2.3% of the total shares issued, respectively. SVF Investment Limited (associated with SoftBank’s Vision Fund), has the largest individual percentage at 29%. SoftBank has further stakes through other funds as well, amounting to at least another 8.8% of the total issued shares. Alibaba comes in via Taobao China Holdings, with shares acquired amounting to 25% of issued shares. Another huge chunk comes from Radiant Pioneer Limited and Radiant Trinity Limited, both registered to the same Cayman Islands address. We could not identify a link to any of the other shareholders, but according to investors who spoke to us on background about this cap table, it likely represents someone who holds a board seat, which we’ll get to next. In accordance with Indonesian law, and similar to the structure of PT Karya Anak Bangsa (Go-Jek’s main legal entity in Indonesia) we shared recently, Tokopedia has a board of directors (BOD) and a board of commissioners (BOC), which has some duties like overseeing the compensation and conduct of the directors. Here’s a link to help understand the difference between directors and commissioners and what roles they are playing in an Indonesian company. The board of commissioners is headed by Kabir Misra, who was a managing partner at SoftBank Capital, but departed to start his own fund not long ago. He retains his role at Tokopedia. Over at Go-Jek, co-founder and CEO Nadiem Makarim is both chairman of the BOD and BOC. The document filed with Indonesia’s foreign investment coordinating board does not match the public record of Tokopedia’s fundraising, but that shouldn’t come as a surprise. It’s likely that the legal entities here are formed to meet the minimum requirements for paid-up capital, several investors told KrAsia. That said, this cap table gives a rough sense of the power structure within the company. There’s a deviation in the number of rounds, which might be because this isn’t Tokopedia’s first legal entity and that this one was formed when foreign investors were starting to come in. The document doesn’t include a founding date for this legal entity. Tokopedia says it was founded in 2009.